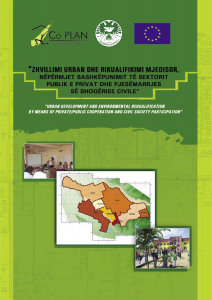 This document aims to mobilize public and private sector co-operation as well as the participation of civil society. The project focuses on priority needs, such as urban waste management, environmental protection, education, etc. The project was realized with the cooperation of Kuçova and Kamza Municipality, as well as under the technical support of Co-PLAN with the support of CISP (International Committee for People’s Development).